Red Beach’s young athletes claimed an illustrious double at Omaha during the weekend of the Northern Region Junior Surf Championships. In a clean sweep they won the overall points trophy for a fourth consecutive year and regained the Cath & Eddie Millar Cup which was last won by Red Beach in 2017. Fine weather prevailed over the two days for the 320 athletes competing although a gusty easterly on the second day of the championships whipped up some testing conditions. Many sparkling performances were delivered by the club’s 81 athletes, highlighting the tremendous depth and talent within Junior ranks. 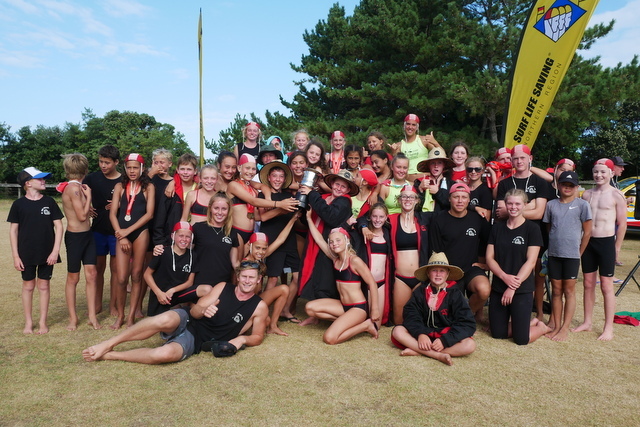 “It was a very good weekend for our young athletes,” said club coach Jack Gavin who was supported on the beach by JuniorSurf coaches Justin Parkes, Jade Hughes & Ella Moratti. “The club has been placing emphasis on building the culture of the club and, as a result, everyone was supporting one another throughout the weekend,” he added. Red Beach (130) 1, Mairangi Bay (125) 2, Orewa (69) 3, Muriwai (19) 4, Omaha (14), 5, Piha (10) 6, Bethells Beach (8) 7, Ruakaka (6) 8, Waipu Cove (3) 9. Red Beach (48) 1, Mairangi Bay (42) 2, Orewa (25) 3, Muriwai (10) 4, Piha (7) 5, Bethells (6) 6, Omaha (5) 7. 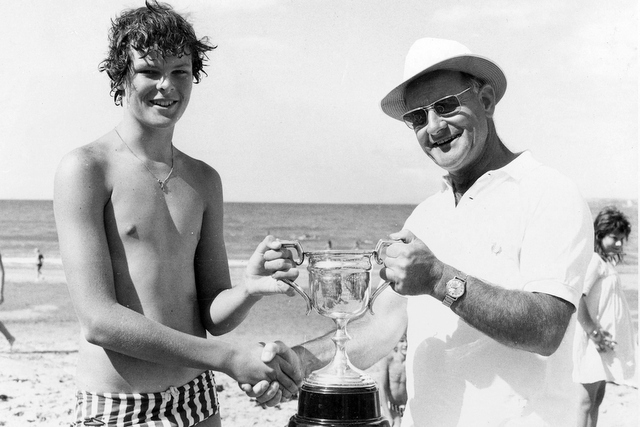 Flashback to 1976 : Red Beach club member Andrew Olsen receives the Cath & Eddie Millar Cup from cup donor Eddie Millar following the club's overall points win in 1976. The trophy was first contested in 1975.